SpaceX posted a new animation to their Web site yesterday illustrating what a launch of their new seven-person spaceship, the Dragon, will look like, and some new details that are sure to intrigue space enthusiasts. SpaceX is a private company started by entrepreneur Elon Musk (of Paypal and Tesla Motors fame) with the express purpose of lowering the cost to orbit by a factor of 10. Their first rocket, the Falcon 1, achieved orbit on its fourth test flight and is now the lowest-cost production satellite launcher in the world. Dragon is a low-cost cargo and/or seven-person space capsule that SpaceX is developing for a series of NASA space station resupply contracts. It is designed for launch on their new Falcon 9 booster rocket, which is slated to make its first launch this summer. 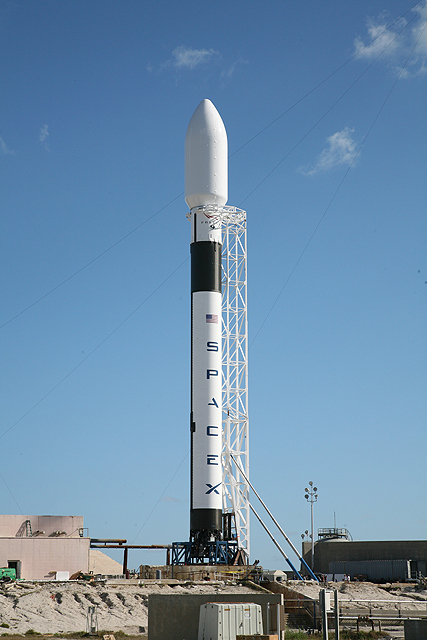 The first test of the Dragon is also scheduled for sometime in 2009. The Dragon and both stages of the Falcon 9 are designed to be recovered via parachutes and a water landing, and eventually reused to further reduce costs. If SpaceX can successfully implement reusability of both stages and the space capsule, it will be the first fully-reusable spaceship in the world (the Space Shuttle discards its external fuel tank with each launch). Even without reusability, the Falcon 9 should offer the lowest cost per-pound for an orbital booster, and the Dragon the lowest cost per-person to orbit. Both the Falcon 9 and the Dragon are being designed for crew transport, though NASA has not yet funded any work on using the Dragon for humans. Such a capability is being referred to as the Commercially Operated Transportation System (COTS) “D” capability. It is believed by many in the industry to be the fastest way to field a replacement for the Space Shuttle, which is currently slated for retirement in 2010. After the shuttle retires there is a scheduled gap of five years before the first flight of NASA’s next spaceship, the Orion. SpaceX claims that a crewed version of the Dragon could be ready for test flights by 2011, and be fully operational by 2012. The SIRCA tile heat shield on the front of the second stage, which should hopefully allow the second stage to successfully reenter from orbit. This would be the first orbital booster other than the shuttle to return from orbit. Docking with the International Space Station instead of berthing. The cargo version of the Dragon will approach the station close enough to be grappled by the station arm, which will then “berth” the capsule to a docking port. This video shows the Dragon docking itself to the station, which might indicate that SpaceX would like to get the Dragon approved for docking, which is an extremely difficult approval to get (currently only the European Automated Transfer Vehicle (ATV) fully meets the ISS docking standards). It is possible that having an onboard pilot can help ease the approval process, but I think we’ll have to wait and see. Anyway, check out the video for yourself. There’s a High Definition (HD) version available for download as well. This entry was posted in Commercial Space, Technology and tagged Dragon, Falcon 9, SpaceX. Bookmark the permalink.